On April 18th at 7:30 pm, GFCA will hold a public meeting to discuss SunTrust Bank’s application to build a stand-alone structure in the Village. The meeting will take place in the Great Falls Library. In November 2016, SunTrust made application to build a new bank building at 778 Walker Road with a drive-thru. That is the current site of our farmers market. In order to have a drive-thru, the county must grant them a special exception. The FC Planning Commission and the Board of Supervisors will be holding public hearings and a final vote on this request this summer. No date has been announced as of yet for the hearings or the vote. To eliminate a rule that would require the bank to install a loading space. Several GFCA board members met with the applicant in February. Following the meeting, John Colby, a local architect, was asked to review the proposed structure. After reviewing the proposed plans, he met with the SunTrust representative and their architect. He was successful in convincing them to redesign the proposed building, making it more harmonious with the village area. SunTrust will make a presentation to the community at this April 18th meeting. They will present their new building design and take questions from the community. On March 22, Fairfax County DOT held a public hearing to discuss the next two phases of the Georgetown Pike Trail. This meeting was covered previously by GFCA in our newletter and website (see https://gfca.org/Featured-News/4703056). The meeting was held and 20+ people attended. Following the presentation and questions, comments about the plans were generally quite positive. The Connection Newspaper published a good summary of the meeting their March 29 – April 4 edition, which is available on their website http://www.greatfallsconnection.com (then finding the publication by date or searching ‘georgetown pike trail’). The two trail phases reviewed at the hearing will complete a walking and biking trail from Seneca Corners to Utterback Store Road. The next phase (called Phase 5) would connect Utterback Store Road to Great Falls Village. For more information, or if you have an interest in joining GFCA’s Trails effort, please contact GFCA’s Long Range Planning Committee, by emailing planning@gfca.org. To counter tree loss and preserve our natural habitat, GFCA is once again partnering with Fairfax ReLeaf to distribute seedlings free-of-charge to Great Falls residents who will give them a good home on their property. Our spring plant distribution will be on April 8, at the Farmer's Market, between 9 am and 1 pm. Roughly 500 plants will be given away on a first-come first-served basis - so come early if you're interested. Seedlings will include River Birch, Sugar Maple, Virginia Pine, Redbud, Black Chokeberry, and Red Osler Dogwood. 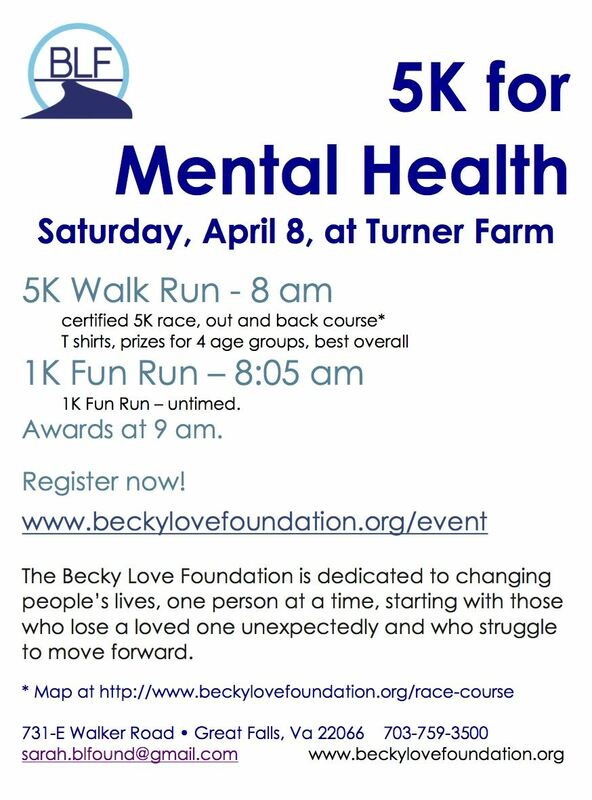 The Becky Love foundation is sponsoring a race and a fun run on Saturday April 8 at Turner Farm. The foundation raises money for mental health. See information below, and go to www.beckylovefoundation.org/events for more details and to register. Facing rising public opposition from Great Falls residents, organizers of the Senior PGA Golf Championship scheduled at Trump National on May 23-28 will not be using Seneca Road and have withdrawn their request to use the road through Seneca Regional Park for spectator buses inbound to the tournament. Such use could have created traffic and safety issues along Seneca Road from Route 7 to the Potomac, and also caused access issues for residents and their guests beyond a checkpoint somewhere along Seneca Road (needed to provide security). Now, the buses will be routed entirely through Loudoun County, and security will control access to the golf course from Seneca Regional Park. As a result of the PGA decision, GFCA has canceled the planned TownHall meeting on Mar 20 that was to have discussed this. Additional information on the tournament and details impacting Great Falls residents will be posted on gfca.org in the weeks leading up to the tournament. 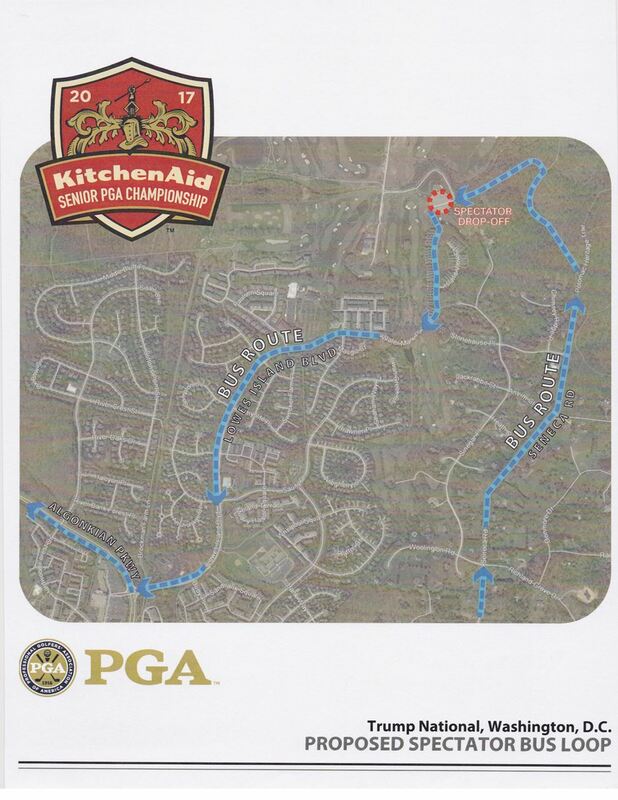 The PGA will be hosting the 2017 KitchenAid Senior PGA Championship at Trump National Golf Course in Potomac Falls from May 23-28. GFCA has met with representatives of the PGA, and has arranged a public TownHall meeting to give Great Falls residents an opportunity to learn about the event’s impact on Great Falls, ask questions, and provide input to the organizers of the event and to Fairfax County officials. This meeting will be held on March 20, 7:30 p.m., at the Great Falls Library. GFCA members, residents near Trump National, and the general Great Falls public are welcome. The tournament will be held from May 23 - 28 (Memorial Day weekend). 50,000+ spectators are expected, with perhaps 12-14,000 on the busiest day. Official hotels for the event are in Reston, and most parking for the event will be at Dulles Airport and One Loudoun (Route 7 in Loudoun County). Access to the golf course by private vehicles and taxicabs will be via Algonquian Parkway and Lowes Island Blvd. There is a proposal for spectator buses to be routed from the off-site parking areas to the Club in a loop. Inbound buses to the course would be routed north on Seneca Rd in Great Falls, and then outbound from the Golf Club on Lowes Island Blvd (see the proposed route map). This would put buses running (at peak times) perhaps every 15 minutes northbound on Seneca; at non-peak times they would run 1-2 per hour; buses would operate from 5 a.m. through early evening. For security and traffic control, Seneca Regional Park may be closed during the event. Non-resident traffic northbound on Seneca would probably be stopped at an appropriate point (e.g. Beach Mill Rd) to avoid the congestion of turnarounds at the end of Seneca near the Golf Club. GFCA was assured that this routing would only be for spectator buses, and not for shuttles or any other “official” event traffic. Residents of Seneca are concerned about the impact on traffic and access to/from their homes. Other citizens have expressed concerns about possible restrictions at Seneca Regional Park over Memorial Day weekend. GFCA encourages all concerned and interested citizens to attend this TownHall meeting on Mar 20 to hear from and speak with the PGA organizers. Check gfca.org for more information and updates. Two new segments of the Georgetown Pike pedestrian/bike trail are being planned, for completion in 2018. These segments, designated Phases III and IV, will connect Seneca Road (at Seneca Square) to the existing trail (Phase II) that runs from Utterback Store Rd to near Falls Bridge Lane. When completed, the 6 ft wide asphalt surface trail will allow walkers, joggers and bicyclists to transit along Georgetown Pike from Seneca to Utterback Store Rd. A future project (Phase V) will connect the trail from Utterback Store Rd into Great Falls Village, and to Turner Farm - as well as to Forestville Elementary. Phase V is awaiting a decision on funding from the County in the current FY2018 funding process. Here are schematics of the current Phase III and IV designs. Fairfax County DOT will hold a public hearing on these plans on Mar 22, 7:30 p.m. at the Great Falls library. If you have an interest in supporting the development of a lasting and functional trail system in Great Falls, or want to hear about these segments specifically, please plan to attend this presentation, open to the public. FCDOT will accept comments on these plans through mid-April. Celebrate Great Falls Foundation, in coordination with the Great Falls Garden Club, is launching a major project to beautify a section of the Village. They will be planting 14 beautiful native trees along both sides of Walker Rd, from Georgetown Pike south to the edge of the commercial district. This area had "bump-outs" installed a few years ago to improve pedestrian safety and traffic flow. They will be native trees - such as Sourwood, American Plum, Fringe-Tree, Serviceberry, and American Hornbeam. These trees have been pre-approved by VDOT, as well as by County arborists for beauty and tolerance to harsh roadside conditions. They estimate project costs - including trees, planting and first year care - at $20,000. GFCA recently approved a $1,500 grant to assist. If you would like to support this project with a tax-deductible contribution, please use the attached form, which can be mailed or emailed, or visit the Celebrate Great Falls Foundation website. Donations should be made out to CGFF. Two new segments of the Georgetown Pike pedestrian/bike trail are being planned, for completion in 2018. These segments, designated Phases III and IV, will connect Seneca Road (at Seneca Square) to the existing trail (Phase II) that runs from Utterback Store Rd to near Falls Bridge Lane. When completed, the 6 ft wide asphalt surface trail will allow walkers, joggers and bicyclists to transit along Georgetown Pike from Seneca to Utterback Store Rd. A future project (Phase V) will connect the trail from Utterback Store Rd into Great Falls Village, and to Turner Farm - as well as eventually to Forestville Elementary. Phase V is awaiting a decision on funding from the County in the current FY2018 funding process. Here are schematics on the current designs. More information is available at the county's website here. Starting at 7:30 p.m. on Feb 21, GFCA's TownHall will focus on review and discussion of the proposed Fairfax County and Fairfax County Public Schools Budgets for Fiscal Year 2018. Supervisor Foust and Schools Board Member Jane Strauss will introduce the proposed budgets. Joe Mondoro, the Chief Financial Officer for Fairfax County, and Kristen Michael, Assistant Superintendent of Finance for FCPS, will explain the budgets and the policy choices reflected in them. This year’s budget process has been an extremely difficult one, balancing the needs of our schools and county services and programs. Budget pressures are also resulting from rising Pension costs and historically underfunded county/school employee pension plans. The defeat of the Meals Tax prevented one avenue for raising tax revenues. As of this writing, the budget has not been set however final decisions will be made by the County over the next week. This is an opportunity for all to have the budget explained, and to ask questions of the county experts involved. The TownHall meeting will be held on Tuesday, February 21, 7:30 p.m. at the Great Falls Library (Meeting Room). GFCA members and the general public are welcome.